Rule of law versus Rule by law. 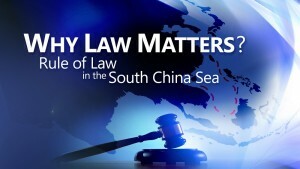 Who owns what in the South China Sea? From the risk of territorial clashes in the South and East China seas to maritime boundary fishing disputes, countries in the region are accusing Beijing of threatening regional stability across Asia’s waters. 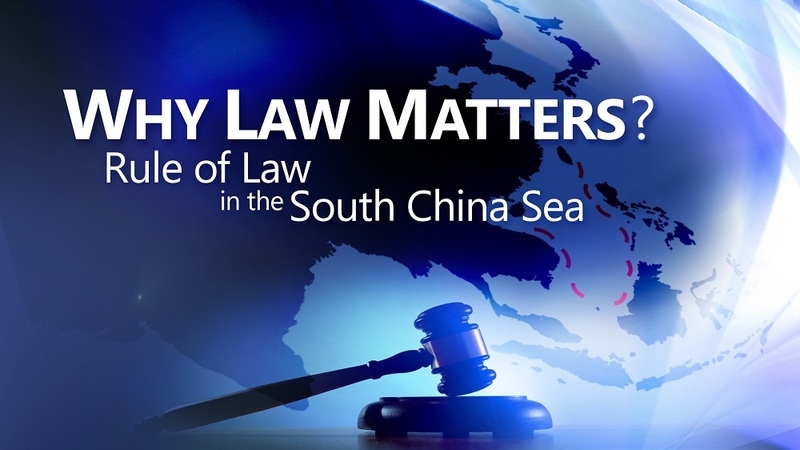 Can international law help stave of escalating conflict in the region? If not, what diplomatic efforts can states take to avoid a brewing war from breaking out? Jane Chan is a Research Fellow and Coordinator of the Maritime Security Programme at the S. Rajaratnam School of International Studies (RSIS) in Nanyang Technological University (NTU), Singapore. She has a LL.B from University of Tasmania in Australia and she also holds a MSc. in International Relation from Nanyang Technological University, Singapore. Her main research interests include maritime security issues in Southeast Asia, law and order at sea, regional maritime cooperation and confidence-building measures. She is also an affiliated faculty at the Singapore Arm Forces (SAF)-NTU Academy (SNA). Her publications include a co-edited volume with Professor Geoffrey Till on Naval Development in Southeast Asia (Routledge, 2013), and the RSIS policy paper on Good Order At Sea in Southeast Asia, which was part of the background documents for the ARF ISM on Maritime Security. She is a regular commentator on maritime security issues and has presented at various international conferences and seminars. Lucy Reed was a partner from 2000-2016 with the international law firm of Freshfields, where she headed the international arbitration and public international law groups. She has represented private and public clients in more than 100 complex commercial and investment treaty arbitrations, focusing on energy and Asia disputes. She was awarded the 2014 Asia Women in Business Award for Best in Dispute Resolution. Professor Reed is active as an arbitrator, and served as a Commissioner on the Eritrea-Ethiopia Claims Commission (the first Geneva Convention/international humanitarian law tribunal) and as Co-Director of the Claims Resolution Tribunal for Dormant Accounts in Switzerland (the first Holocaust claims tribunal). She has focused her pro bono work on gender violence issues. Her career has also included several years of high-level public service. While with the US State Department, she served as the US Agent to the Iran-US Claims Tribunal in The Hague and a lead adviser on international claims and investment disputes. Later, as the first general counsel of the international organization KEDO (Korean Peninsula Energy Development Organization) in New York, she led diplomatic and nuclear energy negotiations with North Korea. Professor Reed is the former President of the American Society of International Law. She is a member of many professional bodies, including the ICC Court as Vice President, the Singapore International Arbitration Centre Court, and the Governing Board of the International Council for Commercial Arbitration. She is author of numerous articles and co-author of three books: “A Guide to the SIAC Arbitration Rules” (OUP 2014), “Guide to ICSID Arbitration” (2nd edition, Kluwer 2011) and “The Freshfields Guide to Arbitration Clauses in International Contracts” (3rd edition, Kluwer 2011). She delivered private international law lectures at the Hague Academy of International Law in 2001. Professor Reed was educated at the University of Chicago Law School (Juris Doctor 1977) and Brown University (Bachelor of Arts 1974). She is a member of the New York bar. Maria A. Ressa has been a journalist in Asia for more than 25 years, most of them as CNN’s bureau chief in Manila then Jakarta. She became CNN’s lead investigative reporter focusing on terrorism in Southeast Asia and wrote “Seeds of Terror: An Eyewitness Account of al-Qaeda’s Newest Center of Operations in Southeast Asia” (Free Press, 2003). The book was the first from the region documenting the growth of Jemaah Islamiyah and its links to Al-Qaeda. In 1987, Maria was one of the founders of independent production company, Probe. In 2005, she took the helm of ABS-CBN News and Current affairs, for 6 years managing more than 1,000 journalists for the largest multi-platform news operation in the Philippines. Her work aimed to redefine journalism by combining traditional broadcast, new media and mobile phone technology for social change.She taught courses in politics and media for her alma mater, Princeton University, as well as in broadcasting at the University of the Philippines. Her latest book, “From Bin Laden to Facebook,” is part of her work as the Author-in-Residence and Senior Fellow at the International Centre for Political Violence & Terrorism Research in Singapore. She was named the Southeast Asia Visiting Scholar at CORE Lab at the Naval Postgraduate School in Monterey, California. Despite documenting some of the worst disasters and uprisings in Southeast Asia, she believes in the goodness of human nature and in the transformative powers of media and technology. Malcolm Cook is a Senior Fellow at ISEAS-Yusof Ishak Institute in Singapore. From 2003 to 2010, he was the inaugural East Asia Program Director at the Lowy Institute in Sydney and then the inaugural Dean of the School of International Studies at Flinders University in Adelaide. Before that, he was a lecturer at Ateneo de Manila University in the Philippines. Malcolm has worked in Japan, South Korea, the Philippines, Australia and Singapore.